This wisdom has been running through my mind a lot lately. And not just because of our currently heated national conversation on what kind of a country we want to live in. It’s also because of something that’s been taking place right here at DeKalb County Farm Bureau, something that takes place every year at this time. Students and teachers understand why farming matters. Farmers and others who work in agriculture are valued for their contribution to society. Consumers can go to the grocery store and feel a personal connection to someone who produces the food they buy. The agricultural community cares about the education and well-being of all our children. It’s not just the classroom volunteers who are voting to shape our community. It’s the retired Ag Literacy Committee members who call me to say, “What can I do?”—and then spend an entire afternoon in my office labeling teacher thank-you gifts and gift bags. It’s the Ag Literacy Committee spending an evening counting, bundling, stuffing, and labeling—all while discussing other ways to increase agricultural understanding in our county and beyond. And it’s also the teachers who reserve precious classroom time to focus on agriculture. I never feel as though I adequately thank these individuals for the time and energy they devote to Ag in the Classroom. I try, though. I love it when I can catch volunteers returning supplies after their presentations. That’s when I can say “thank you” in person, and hear stories about their classroom visits. By the end of this month, over 100 people in our county will exercise democracy by volunteering for Ag in the Classroom. I know they’re busy, but they step forward and take the time to do so anyway. For that, I am grateful. This post also appeared as the “Stray Kernels” column in the February 2017 issue of DeKalb County Farm Bureau’s Connections magazine. She’s only 3½ years old. But my daughter is at the “why” stage and actively soaking up any and all information we have the patience to share with her. This, coupled with my job in ag literacy, prompted me to think about what I want her to know about agriculture at this age. So here goes. Here are six things I want my child to learn about food and farming while she’s still young, and how I will explain each (if I haven’t already). Food doesn’t come from the grocery store. It comes from farms. I’ve explained to Naya that before food gets to the grocery store, farmers grow or raise it on farms. Then some things–like bread, applesauce, and bacon–go to processing plants to be made into the foods we eat. They are then shipped to the grocery store where we buy them to take home and eat. Farms are places where plants are grown or animals are raised for all of us to eat. It doesn’t make sense to say food comes from farms and not explain what a farm is. We also point out farms as we travel and talk about what might be grown or raised at each one. Farmers are the people who raise our food. I want my child to know that farmers are essential to our lives. Why? Because without them we would all have to grow our own food. Most of us don’t have the time, knowledge, or space to produce everything we eat. The fields around us aren’t just scenery; they are our food. I often call my daughter’s attention to the beauty around us. Our rural landscape of corn and soybeans is peaceful, open, and pretty. It’s also where some of our food comes from. I will explain to her that the plants growing in farmers’ fields are called crops. My daughter, exploring a cornfield at the age of two. I want her to know that the field around us provide some of our food. Chocolate milk doesn’t come from brown cows. I don’t know why adults persist in saying this. Some must think it’s funny, and a few apparently think it’s true. Either way, if you tell a little kid that chocolate milk comes from brown cows and don’t quickly explain that you’re just being silly, they will believe you. Unless they live on a dairy farm or someone has already told them otherwise, they don’t know any better. I want my daughter to know better. She doesn’t yet seem interested in chocolate milk, but when she is, we will explain that all cows give white milk, and humans add the chocolate later on. As Naya continues to grow and ask “Why?” the information we can share with her will obviously become more complex and in-depth. But this seems like a good place to start. What do YOU think a preschooler should know about agriculture? This post also appeared as the “Stray Kernels” column in the Sept.-Oct. 2016 issue of DeKalb County Farm Bureau’s Connections magazine. If you want to push one of my hot buttons, just make a spiteful comment about how teachers have it easy because they only work for nine months and get summers off. It will get me going every single time. Although I’m trained as an educator, my last experience with formal classroom teaching was 24 years ago, when I spent a semester student teaching a multiage first and second grade classroom in central Illinois. Those few months left me with empathy for teachers that will never, ever, leave me. Here’s what I learned about the life of an elementary teacher. First, I discovered that teaching is physically tiring. During the school day, the constant instructing, standing, and moving combined with the bombardment of need from 20-some little people is draining. And it doesn’t stop when they leave the classroom. I’ll never forget the late nights reviewing that day’s student work and trying to create engaging, hands-on lessons for the next day. It felt like I never got enough sleep before it was time to gather all my supplies and head back to the classroom. I found that teaching is also mentally and emotionally exhausting. Every lesson, every interaction with a student is fraught with possibilities and pitfalls. I remember a highly-involved lesson that went so well I felt giddy afterwards. I also vividly recall too-harshly reprimanding a child and watching his face crumple into tears. Whether positive or negative, teachers will tell you that experiences like these are emotionally demanding. Like the physical toll, I learned the emotional toll doesn’t end when the kids leave. One evening, I enlisted the help of a friend to decipher a sentence scrawled by a first-grade boy. After several minutes of scrutiny, we interpreted these words: “It scares me when my mom and dad yell at each other.” My heart ached for this child, whom I had previously only viewed as a classroom mischief-maker. Ask any teacher and they will tell you similar stories of students whose circumstances kept them awake at night with worry. As demanding as it was, my student teaching experience still didn’t include many additional stressors that today’s classroom teacher contends with. I didn’t have to administer standardized tests, for example, nor was I required to interact with school administrators or parents. So. Those summers off after the school year ends? After all the long days, late nights, and weekends of preparation, grading, and worrying, I believe teachers urgently need and richly deserve time to relax and recharge before the next school year begins. Teachers on their summer “break,” participating in our 18th annual Summer Ag Institute, a 40-hour NIU graduate course. As soon as school was out this spring, however, 13 local teachers spent several long days of their “break” time attending our Summer Ag Institute (SAI), exploring ways to inject food, farming, and career information into their classroom teaching. They joined many colleagues who ended their school year only to begin courses or attend conferences to further their professional development. A week later while I was attending the National Ag in the Classroom conference, the previous week’s SAI participants still weren’t resting. They were working on their course assignments. Every day I received a barrage of emails with lesson plans, journals, and papers attached. In the meantime, most of my fellow conference attendees were—you guessed it—teachers on summer break. What is this “summer break” people speak of? When do these teachers rest? From what I can tell, the answer is: Teachers do rest and recharge in the summer… but not for the three months non-educators may imagine. Many teachers spend early summer taking professional development classes and workshops, mid-summer squeezing in a family vacation, and the final weeks of break preparing for the new school year. Some also teach summer school or work part-time jobs. Even addressing health challenges often waits until the school year ends. A fourth grade teacher friend of mine had knee replacement surgery within days after school let out. She’ll be having the other knee replaced yet this summer, allowing enough healing time so that she can be on her feet to teach again in August. Summer “break?” Yikes. As is true for most working adults, I don’t get a summer break. But I still don’t begrudge teachers theirs. And to the 220 area teachers over the past 18 years who have spent the first part of their summer break with me, participating in the Summer Ag Institute, thank you. Thank you for devoting so many hours of your “break” time to continue learning so that you may enhance your teaching. This post also appeared as the “Stray Kernels” column in the July 2016 issue of DeKalb County Farm Bureau’s Connections magazine. Asking others for help has never been my strong point. I’m a fiercely independent introvert, and I tend to want to figure things out on my own while talking to as few people as possible. It’s not that I don’t like people, or don’t like talking. If you halfway know me and ever happen to drift by my office, I might talk your ear off. I’ll probably say ten awkward things before I finally remember that you have other things to do. Then you’ll leave, and I will take a deep breath and let my scattered thoughts settle for a few moments before I continue working. I’ll be delighted to have talked to you, but I’ll still have to regroup afterwards. I like people, and I like talking, but it wears me out. Susan Cain, author of the (terrific) book “Quiet: The Power of Introverts in a World That Can’t Stop Talking” explains that extroverts are energized by stimulation and social interaction, while introverts are energized by quiet reflection. I am at my most productive and creative in a quiet space. But it’s January, and it won’t be quiet long. January in my world means gearing up for our Ag in the Classroom program. Gearing up for Ag in the Classroom means fielding requests for presentations from 140-150 teachers. It means obtaining, organizing, and preparing supplies (like corn and soybean seeds for first graders to plant and rock salt so second graders can make ice cream). Most of all, January means I will be busy asking at least 100 people for help. Preparing Ag in the Classroom supplies means asking the Ag Literacy Committee for help! That’s how many people it takes to visit all those first through fourth grade classrooms to teach kids in our county about agriculture. And you know what? It’s AWESOME. I love it. I love the energy, enthusiasm, and generosity of our volunteers. I love hearing from teachers and sometimes even parents what a profound impact those volunteers have on their students. But it’s not easy. Introversion aside, I am acutely aware of the fact that each prospective volunteer, upon receiving an e-mail or a call from me, may think something like, “Oh, shoot. She found me.” As you read or listen to my plea for help, all the things that are on the plate you call life will flash before your eyes: Getting your farm tax documents in order. Attending your kid’s dance rehearsals. Delivering seed. Your mother-in-law’s illness. Your other kid’s sporting events. Your job. Your… whatever. I get it—you’re busy. And here I am, asking you to volunteer. To walk into classrooms and talk to kids about agriculture. You know it will take more time than just the hour or so spent in each classroom. First, there’s the training (if you haven’t presented in the past). Then, reviewing the lesson plan, preparing the materials, and contacting the teachers. And then returning your supplies to my office afterwards. I’m asking you to devote a lot of precious time, in a life that’s already full. I know this. I know that volunteering for Ag in the Classroom means trading productive time in your farm shop or bank office for time spent in a few rambunctious classrooms. Plus, the thing about volunteering is that you don’t have to do it. You don’t have to add another thing to your list of things to do. I know this, too. This knowledge is ever-present as I carefully phrase each e-mail or mentally rehearse each call before I pick up the phone. So if you get that e-mail or call from me, please know that it wasn’t an easy thing for me to do. But I also know that what you will do if you say yes is harder yet… and even more important. P.S. If you have a passion for agriculture and would like to volunteer, you don’t have to wait for me to contact you. E-mail me anytime at rcollins@dekalbfarmbureau.org or call 815-756-6361. I would love to talk to you! This post also appeared as the “Stray Kernels” column in the January 2016 issue of DeKalb County Farm Bureau’s Connections magazine. 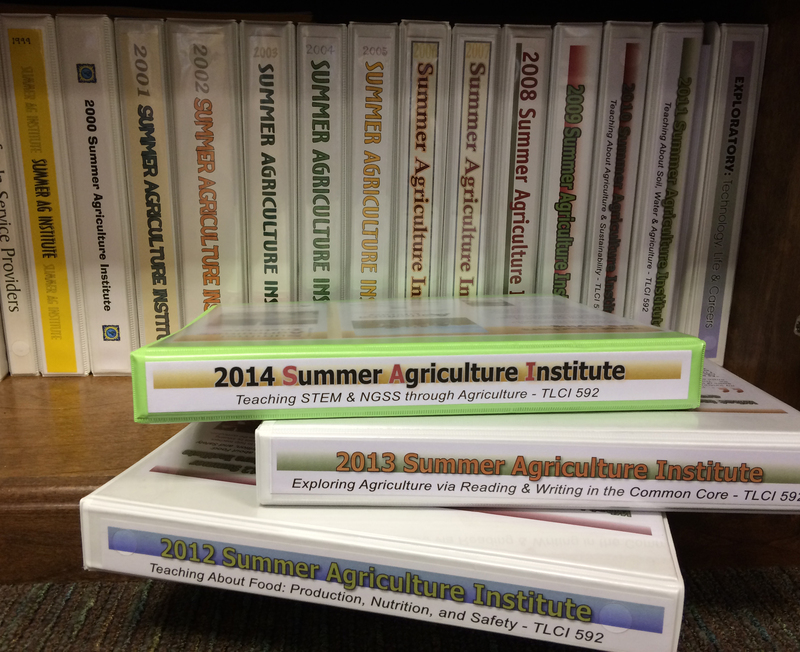 The following is a guest post written by 2014 summer Ag Literacy Intern Kelsey Faivre. Kelsey is a farm girl from DeKalb and sophomore at Iowa State University studying Agricultural Communications. At the beginning of my internship, I thought that I was prepared to talk to people about agriculture. I grew up on a conventional grain farm, raise cattle, and am attending Iowa State University studying Agricultural Communications. Having completed my internship, I’m not sure if anyone can be prepared enough to talk to the non-farm public about modern agriculture. Just one face-to-face conversation with a stranger had me questioning my career goals. It amazed me how fast being doubted made my chest ice over. I found myself wondering why anyone would subject themselves to this. It was an event for families, and I was standing next to our Ag Literacy display. The woman approached me with her hands on her hips. Her little girl ran off to play. “So, what group are you and what do you support?” she asked me. I explained what DeKalb County Farm Bureau was and that I was a summer intern. 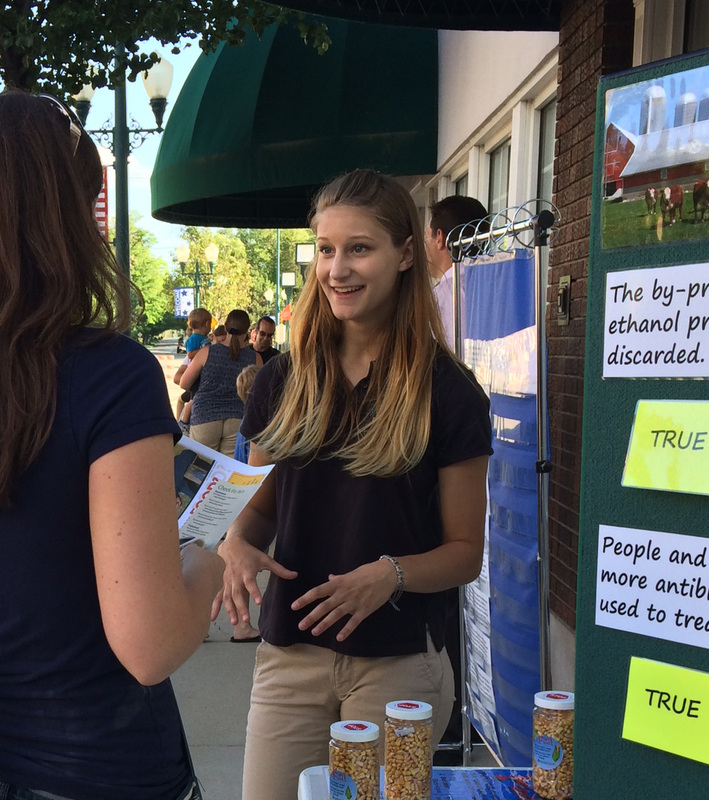 “What is your stance on antibiotics and pesticides?” she questioned. At this point, I had a feeling I was in for a rough conversation. I asked her for clarification, and the next ten minutes were some of the most uncomfortable of my life. I realized afterwards that she had no interest in hearing what I had to say. She may have been posing her comments as questions, but they felt like attacks on my family’s farm practices. It hurt. I believe in what we do and I believe we do it for good reasons, so being attacked is painful. I wondered, if she won’t listen to a farmer, who will she listen to? This wasn’t the first conversation of this kind I’ve had. Each time a friend, family member, or stranger approaches me with these accusatory questions an icy hand clenches around my heart. Yet it’s also exhilarating to find the words that make people say “I’ve never thought about it that way before.” Then I know I’ve made a connection. That’s what gives me hope for the future of agriculture. That’s why I’ve decided not to change my major to something like interior design and leave my agricultural roots behind. That’s why, despite the challenges I know will be in my future as an ag communicator, I’m still following my passion. It’s also true that most people aren’t as aggressive. The other day at the Boone County fair, a man approached me in the beef barn and thanked me for being a farmer. Then, gesturing to the nearby animals, he asked me why some of the horses had nose rings. That’s a conversation I think I can manage. This post appeared in the September-October 2014 issue of DeKalb County Farm Bureau’s Connections magazine. Sixteen binders: Is teaching about agriculture worth all the effort? Sixteen densely packed binders in my office symbolize the years of Summer Ag Institutes (SAIs) we’ve conducted in DeKalb County. Each contains the intricate details of 40 hours of speakers, tours, and activities that make up this annual graduate course for teachers. Planning an SAI means trying to accomplish several objectives at once. These include providing an overview of local agriculture; varying tours and speakers each year so teachers can repeat the course yet always learn something new; planning diverse class experiences tying to a central theme; and fitting in as many learning opportunities as possible without overwhelming or overtiring participants. All of these goals must be achieved while simultaneously meeting the needs of teachers from kindergarten through high school. Some course components fall into place after a call or e-mail while others take days of planning. Either way, I seem to spend a lot of time agonizing over speaker, tour, and travel times while scribbling, erasing, and re-writing schedules. This year there were 13 participants in our SAI. Is it worth doing all that work for just 13 teachers? I believe it is. Here’s why. It’s relevant. When you explore modern agriculture, connections to everyday life become obvious quickly. What does the language on a milk jug mean? If some packages of chicken say “raised without hormones,” does it mean some chickens are given hormones? Is there a difference between the corn we feed livestock and the corn in our freezer? It’s interesting. Did you know that the harsh winter of 2013-2014 killed much of the winter wheat in the county? SAI teachers discovered that some local farmers grow wheat as a source of roughage for cattle and to provide field area for mid-summer application of manure. Do you know the different ways crops are genetically modified? SAI teachers compared traditional breeding, mutagenesis, RNA interference, and transgenics during a lively discussion of GMOs. C’mon, this stuff is fascinating! This post appeared as the “Stray Kernels” column in the July 2014 issue of DeKalb County Farm Bureau’s Connections magazine.